Is there a connection between ‘banana money’ and ‘banana republic’? No actual connection, I think. The term ‘banana money’ refers to the currency notes issued during the Japanese Occupation. The notes had no serial numbers. These currency notes had pictures of bananas on it, hence the name. Of course, towards the end of the Occupation with the Japanese losing the war the banana money dropped rapidly in value and ‘banana money’ became an uncomplimentary term. Likewise, the term ‘banana republic’ is not a complimentary term. It refers to the countries (republics) in Central America which switched their agricultural efforts to growing bananas to export to USA. Their exports, and consequently income and revenue, depended substantially on the demand for bananas in the USA. Thus, a ‘banana republic’ is therefore not a strong independent country. In defence of the banana I must say that, today, the banana is held in high regard as a health food. (Have you noticed the tennis stars having a banana during the rest breaks in a tough game?) So, if you tell a fitness fanatic that you have ‘gone bananas’ he might turn around and congratulate you on your change of eating habits! The Japanese Occupation of Singapore began 60 years ago in February, 1942. Most people would not have noticed the remindersof this period of Singapore history. The nearest, I think, of these reminders is a NHB (National Heritage Board) marker close to the Jurong Junior College. This NHB plaque marks the Jurong-Kranji Defence line, the narrow ridge connecting the sources of the Jurong and Kranji rivers. The Allied troops were supposed to defend this line strongly against the invading Japanese troops which had landed at Sarimbun beach (there is another NHB marker there just outside the MOE‘s campsite). Unfortunately, General Percival’s secret orders to withdraw to the last defence line around the city, only if necessary, were misunderstood. Without fighting the defending troops withdrewon 10 February 1942 and this allowed the Japanese troops to sweep through to Bukit Timah. This NHB marker is located between Blocks 549 and 556, Jurong West St 42. Another reminder of the war is the Japanese Cemetery Park in Chuan Hoe Avenue. Chuan Hoe Road is not far fromSerangoon Gardens. You can find the exact location of the cemetery park from the road directory. A couple of Retrievia issues back, I mentioned a way of testing whether a person was a true musician. Here’s the test. A true musician is one who, when he hears a lady singing in the bathroom, tiptoes quietly to the door of the bathroom, feels for the keyhole and, then, puts his EAR (not eye ) to the keyhole. A teenage girl had just been allowed to join the sisterhood of an old and conservative convent. The Mother Superior of the convent told the youngster to henceforth conduct herself with dignity and decorum; i.e., NO CURLERS in her hair, NO RUSHING around, and NO SINGING in the bathroom. Besides NO SINGING in the bathroom, she would have to bathe with her clothes ON! YES, bathe with clothes ON! Young girl: But why do I have to bathe with my clothes ON? Mother S: Hush! Child! Don’t you know? God can see everything. This means God can see through walls and see you bathing. That is why you must bathe with your clothes ON . Young girl: But, Mother Superior, if God can see through walls, Surely, He can also see through my clothes! Well, as the saying goes, “Children should be seen and not hurt!”. You have not heard about this? Apologies, indeed. This Tiger Woods thing is an open secret. I did not want to publicise this earlier so as not to cause ‘pandamonium’. If you look out from any high point in NIE (such as the Library) you will see that much of the surroundings around NTU campus, a stone’s throw from the Choa Chu Kang area, consists of woods and secondary forests. 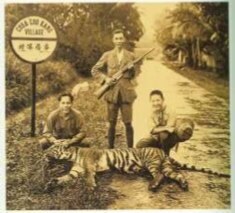 Not too long ago there were tigers roaming in the woods of ChoaChu Kang; hence, ‘Tiger Woods in NTU’. Well, take a look at the photo. See the sign saying, “Choa Chu Kang Village” in the photo and the big pussycat in the foreground? If you turn left at our Jalan Bahar exit and head towards Lim Chu Kang Road you will see a road sign with the words “Choa Chu Kang Village” on it. The Nobel Prizes are the most highly regarded of international awards. The prizes come from a fund set up by Alfred Nobel, the Swedish scientist who invented dynamite and other explosives. The Year 2001 marked the 100th anniversary of the first Nobel Prize awards which were for Physics, Chemistry, Physiology/ Medicine, Literature, and Peace. The sixth award, for Economics, was set up in 1968. To mark the 100th anniversary, Britain issued a set of 6 stamps, one for each of the disciplines. You can buy this special stamp issue from philatelic agents in Singapore for about $10 a set. The Literature stamp in the set features a poem by T.S. Eliot, who won the Nobel Prize for Literature in 1948, entitled “The Addressing of Cats”. One colleague told me there is some connection between this poem and the musical “Cats”. I can’t recall what the connection is. Anyway what I wanted to do is to tell you a more juicy puzzle concerning the Nobel Prize: Why is there no Nobel Prize for Mathematics? One hypothesis goes that Alfred Nobel was in love with the famous lady Russian mathematics professor, Sofya Kowalewskaja, shortly after her arrival in Sweden. However, Ms Lowalewskaja fell in love with another Swedish mathematician at the University of Stockholm by the name of Professor Mittag-Leffler. Apparently, Prof Mittag-Leffler was an outstanding mathematician and, in Nobel’s opinion, if a Nobel Prize for Mathematics was set up Mittag-Leffler would be a very strong candidate and possibly win the award. So, to prevent such a possibility, Nobel decided not to have a prize for mathematics! [Thanks for reading ReTRIeVIA. The posts (for Year 2002) will resume sometime in December 2007. Cheers! Some of us may remember that Singapore was an important military base in the Far (so-called) East for the British government. Consequently, it was a greatly desired prize for the Japanese in World War 2. The British had expected the Japanese forces to attack by sea and much of the military hardware was concentrated in the southern part of Singapore(Labrador, Sentosa, etc). As Peninsular Malaysia was conquered earlier, another possible route of attack would be by way of the Causeway at Woodlands. However, the Japanese infantry shrewdly attacked by crossing the Straits of Johore and landing at Kranji and Sarimbun. To fight the Japanese coming in from these 2 points, the British put up the Kranji-Jurong Defence Line. These 3 places (Sarimbun, Kranji and K-J Defence Line) have been designated as historic sites and you can see the NHB (National Heritage Board) signs there. The nearest historic site, close to Jurong Junior College, is at Jurong West Street 42. The next-nearest historic site is at Sarimbun Beach just before the Ministry of Education’s campsite. You can get a good view of the Straits of Johore from this site. To reach the place, go along Lim Chu Kang Road and turn into Jalan Bahtera. Incidentally, next to the MOE campsites are those belonging to the Singapore Scout Association and the Singapore Girl Guide Association. The Girl Guide campsite is known as Camp Christine. Re-trievia quiz: Who is Christine?